CHAO KHUN CHAI DIT, the third son of Chao Phya Arkara Maha Sena (Bunnag) and Chao Khun Nual, was born in 1788. He began his career with the title of Chamuen Waiworanart, Head of the Royal Pages in the court of King Rama I. In the reign of King Rama II, he was appointed Head of the Royal Household and received the title of Phya Suriwongse Montri. During the later part of King Rama II, he became Minister in charge of the Royal Treasury, Customs and Foreign Affairs. He received the title of Chao Phya Phra Klang (The Chao Khun Kromma Tha). A few years later, in addition to the positions he was holding, he was made Minister of Defence. He retained these positions right through the reign of King Rama III and King IV until he was appointed Regent of Siam. King Rama IV, in 1851, appointed him Regent of Siam and bestowed the title of Somdej Chao Phya Borom Maha Prayoorawongse (Dit), he was known by the populace as 'Somdej Ong Yai'. He was also bestowed with the insignia of authority, a sword (which was studded with gems inlaid in enamel and gold, with three Royal Seals) to enable him to issue decrees. He served under a very difficult time-when England and France were trying to expand their colonies in South East Asia. Siam, at that time, represented a tantalizing prize! By Grace of the Sacred Triple Gems, the wisdom of King Rama IV, and the shrewdness of Somdej Chao Phya Borom Maha Prayoorawongse (Dit), Siam stood clear of the imperialistic threat during This period of time. He was also responsible for the first road ever constructed in Dhonburi, Which is named after him the 'Somdej Chao Phya Road'. It began at the Pak Klong Sarn River landing, continued to Wat Prayoorawongse Sawas (The Family Temple), and ended at the ferry landing which served to cross the Chao Phya River to Bangkok. It was just under the Phra Buddhayodfah Memorial Bridge built By King Rama VII to commemorate the founding of the Chakri Dynasty and the 150 years of the founding of Bangkok. Khun Chai Chuang, Somdej Chao Phya Borom Maha Sri Suriyawongse, Regent in the reign of King Rama V.
Khun Chai Choom, Phya Montri Suriyawongse in the reign of King Rama V. Headed a Diplomatic Mission to Europe. Khun Chai Kum, Chao Phya Tipkornwongse Maha Kosa Dhibodi. The Minister of Defence in the later part of the reign of King Rama V.
Khun Chai Tuam, Chao Phya Bhanuwongse Maha Kosa Dhibodi. The first Minister of Foreign Affairs under the modern system of government developed by King Rama V. It is his line we will follow. 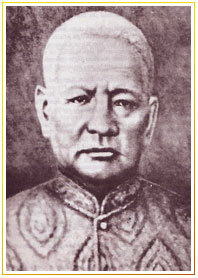 Khun Chai Des, Chao Phya Surabandh Pisutr, Governor of Petchaburi Province. Khun Chai Chumporn, Chao Phya Pasakornwongse, Commander of the Royal Body Guards. The last four were daughters who were in charge of the various sections of the Royal Household. Somdej Chao Phya Borom Maha Prayoorawongse (Dit) was born in 1788 and died at the age of 68 on April 1856. We digress now to mention the second most influential nobleman besides Somdej Ong Yai (Dit). During this period of time. This personage was his youngest brother Khun Chai Tut, born in 1791, the youngest son of Chao Khun Nual and Chao Phya Arkara Maha Sena (Bunnag). He began his career as a page in the court of King Rama II and received the title of Nai Sanit Hoomprae. Later in the reign of King Rama III he was appointed Head of the Royal Chamberlains, and was bestowed the title of Phya Sri Pipatr. In the beginning of the reign of King Rama IV, at the same time as his eldest brother Somdej Chao Phya Ong Yai (Dit) was made Regent of Siam, he was installed as Regent of Bangkok with the title of Somdej Chao Phya Borom Maha Bichaiyayati, known by the populace as 'Somdej Ong Noi' (Tut). Both brothers had their hands full, as we have already mentioned, due to the imperialistic ambitions of both England and France. After a distinguished career, he passed away on February 8th, 1858 at the age of 67. He left thirty-eight children!